Build team spirit with a friend and glass of wine! A 14 oz. decorated wine glass with sophisticated styling that works great with whites, reds, or a mimosa. 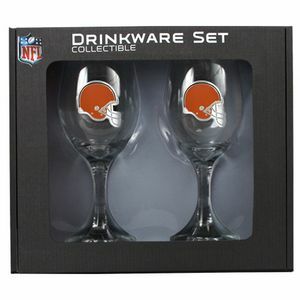 This 8.5” Cleveland Browns wine glass is decorated with a high-quality metal team logo. This fun wine glass is also available for other NFL and MLB teams. This sku is for 2 glasses.